Costa Rica Geography is as diverse as it is beautiful. 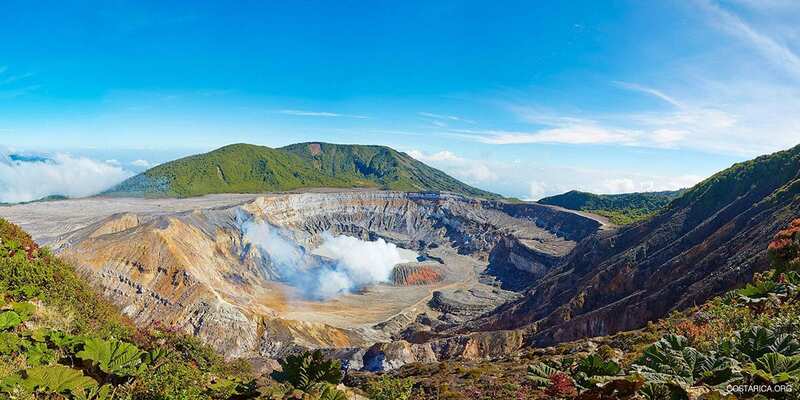 Costa Rica geographical features include over 200 active and extinct volcanoes, steep mountain slopes, endless tropical beaches with sands ranging in colors from sparkling white and pale rose to black. There are acres of primary and secondary rainforests, dry forests, mangroves and cloud forests, swamps, wetlands, raging rivers, lakes and thunderous waterfalls. In fact, there are only three climates on Earth that are not in Costa Rica: tundra, snow and desert (the three least hospitable climates for humans). The Costa Rica geography and geology are unique and largely responsible for the incredible biodiversity found here. In fact, it can be traced back to how and where Central America was formed. About 3 million years ago two tectonic plates pushed against each other. This built the bridge between North to South America. Because of its tropical location 10 degrees north of the equator, many of the native animal and plant species were able to survive the last ice age. To understand why Costa Rica terrain is so rugged and mountainous, you must understand what happened millions of years ago. Costa Rica was formed as the Caribbean tectonic plate pushed up against the Cocos plate continually for about 50 million years forcing the Central America isthmus to be raised off the sea floor. This is why the active volcanoes in Costa Rica are found along the mountain range at the tectonic rift. This runs from South East to the North West. Costa Ricas high mountains were also a result of the many volcanoes. When these volcanoes erupted, they pushed two tectonic plates against each other, creating the high mountains surrounding the Valle Central nowadays. Costa Rica came from a string of underwater volcanoes. Over years of erupting and growing in height and breadth, they eventually broke the sea surface and continued to expand. Over millions of years of erosion and volcanic movement a landmass connecting North to South America was formed. This made animal and plant migration possible. Exotic wildlife and lush flora and fauna came from both from the north and south resulting in Costa Rica’s extraordinary biodiversity. More than 25% of the country’s territory is protected and consists of National Parks, reserves, and refuges, where its biologically diverse riches are preserved for future generations. Costa Rican Geography features nearly 1,300 km or 800 miles of tropical coastline. The Pacific Coastline is more mountainous and makes up about 80% of the coastal land. The Caribbean coast is a quarter of the size of the Pacific and features long stretches of sandy beaches. The Caribbean is highly humid with lower ocean tides and features swamps and mangroves. Along the Pacific Coastline there are high sheer cliffs rising majestically from turquoise lagoons, high tide variations, rainforest to the south and dry forest to the north. In fact, the Pacific Coast has two large, lush peninsulas reaching into the ocean. The Nicoya Peninsula is in the North and the Osa Peninsula is in the South. Osa is home to the abundant rainforest wilderness of Corcovado. Costa Rica has many different mountain ranges, surrounding the Valle Central. The most northern one is called Cordillera de Guanacaste and it consists of several volcanoes, some of which are still active. There are more Costa Rica mountains to to the southeast, called the Cordillera de Tilaran. Visitors flock to popular destinations there like the Monteverde Cloud Forest Reserve and the Arenal Volcano National Park. The Cordillera de Tilaran is in the mountainous central valley, the Cordillera Central, and includes the Poas, Irazu, Turrialba and Barva Volcanoes. Over half the population resides in the central valley. The mountains in the Cordillera de Talamanca to the South are taller and harder to traverse due to steep terrain. Many of the volcanoes of Costa Rica are active: including the Arenal Volcano (currently dormant), Irazu, Turrialba, and Poas. Costa Rica is one of the great wonders of the world because it has the densest biodiversity found on Earth. Primary and secondary forests, mangroves, plains, and volcanoes host an incredible variety of flora and fauna. The highest peak of Costa Rica is the Cerro Chirripo at 3,819 meters, and it is the 5th highest peak in Central America. Irazu is the highest volcano at 3,431 meters, and the largest lake is Lake Arenal, by the Arenal Volcano. Costa Rica has several islands including the largest, Calero Island, Isla del Cano, Cocos Island home to Cocos Island National Park, 480 km from the port of Puntarenas in the Pacific. Costa Rica is a tropical country. It has several different micro-climates throughout the entire country, thanks to the variation in elevation. There are essentially two seasons here, the dry season and the rainy season. The dry season (summer) is from December-April. Temperatures can reach up to 95 degrees Fahrenheit on the coast. In the Central Valley, temperatures stay mild, between 70-85 degrees. Temperatures, however, can fall below 50 degrees F on the highest mountain summits. The rainy season is from May-November. The mornings are hot and humid. Around 2pm it begins to rain. It rains off and on through the afternoon and evening. Some parts of the country, like the Caribbean coastline, experience random rain showers all year-round. Contrarily, the Pacific coast is quite dry most of the year. Costa Rica is located on the Central American Isthmus that is part of the land bridge between the North and South American continents and sandwiched between Nicaragua to the North and Panama to the South. The border with Nicaragua is 313 km long and the border with Panama 348 km long. The Costa Rica coastline is 1290 kilometers long. The Pacific coast is 1,016 km long and the Caribbean coast is 212 km long, covering 50,660 km² of land area. Because of this, Costa Rica is blessed with hundreds of beautiful beaches. Costa Geography is diverse, beautiful and exciting! Majestic mountain ranges, active volcanoes, pristine beaches and lush rainforests make Costa Rica one of the most geographically countries in the world. 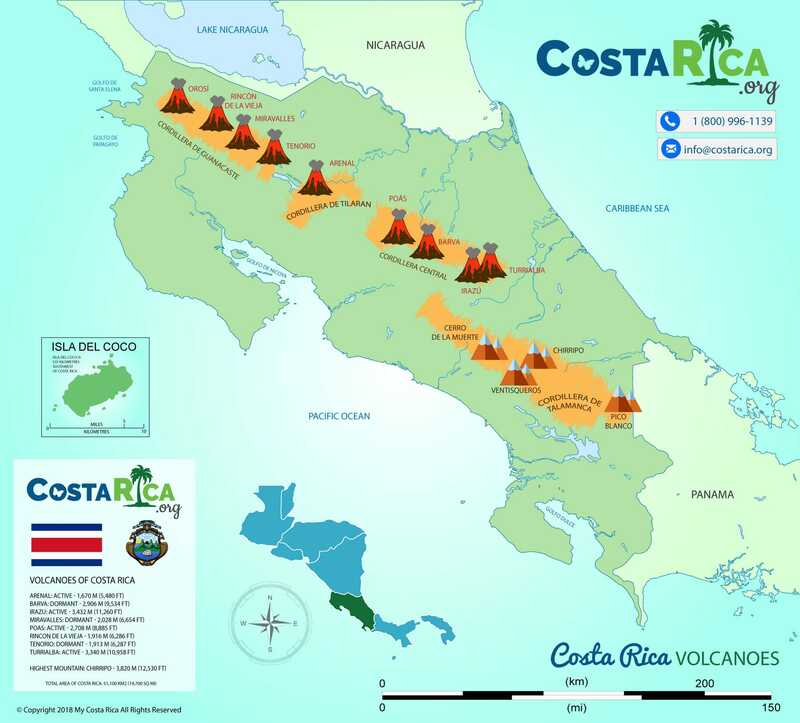 Learn more about Costa Rica geography and take a look at our Maps of Costa Rica!